This Chinese New Year, Realme Malaysia has a special treat for Malaysians, giving them the opportunity to win spectacular prosperous prizes. 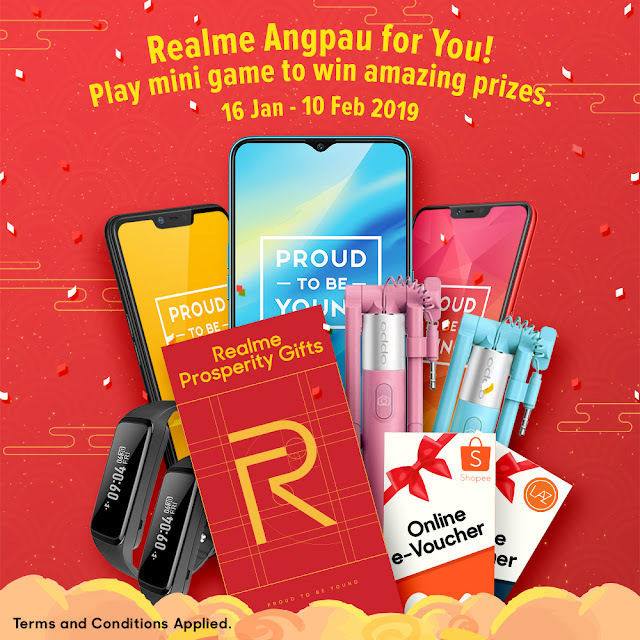 From today till the 10th February, Malaysians can participate in Realme’s “Angpau For You!” campaign - an interactive game where they can slash their angpaus to unlock Realme prosperity gifts such as Realme C1, Realme 2 and Realme 2 Pro smartphones, Olike wrist bands, Oppo selfie sticks and Lazada and Shopee vouchers. “The “Angpau For You!” campaign is our innovative spin of the century old tradition of the handing out of angpaus, which symbolizes happiness and good fortune for the New Year. We want to thank our Malaysian fans for their continuous support and provide them with attractive gifts, through a fun and interactive game, as they celebrate a prosperous and lucky new year,” said Tiffany Teh, Brand Manager, Realme Malaysia. They can participate in this contest by going to this link and play the game to win mystery instant prizes : https://myrealme.my/realme-angpau-for-you/ Each player only gets one chance to participate in the lucky draw. In addition to winning instant prizes, Malaysians will also have the opportunity to win weekly prizes in the form of Realme smartphones. So, how does one become eligible for the weekly prizes?